Hongkong has many beaches and bays that used to be so clean that people could cultivate oysters and dig for mussels, now it's a history since the city has over-developed. But suprisingly, I saw fishing for shrimp in indoor tank when I went back home last year. You may expect to see Caribbean-style interior... errr... no, you only found graffiti on cement walls, foldable plastic chairs lined along the tank (it's half of the size of a standard swimming pool) and speakers at four corners blasting pop songs. This place was very popular by young people. They came in, took their seats, fishing for 2 or 3 hours, no talking loud or bounching around, just very quiet! I was glad that they found an oasis probably not in this city but at least in their heart. That day I caught no shrimp... these mussels weren't from that tank either ... they're bought from a store yesterday and then transformed to another beautiful dish simply by adding fresh vegetable and herb. I hope you'll enjoy it as much as I do! two dozens fresh musselsl (mine medium-small size), cleaned. Heat a large skillet, add some olive oil, saute the diced garlic over low heat for about 30 seconds. Raise up the heat, add mussels and white wine. 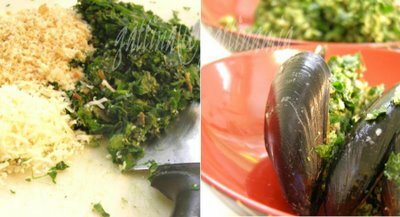 Once the mussels open and the liquid starts boiling, scoop the mussels (they don't need to be fully cooked) in a big bowl, save the juice in another bowl. Heat the skillet, add a bit oil, saute the Swiss chard with a pinch of salt. When it softens, put it in a plate and let cool. Heat two tablespoons of butter in a large skillet, saute the garlic cloves over low heat until they turn golden. Raise up the heat, add tomatoes, saute for two minutes, add mussels and fry for a minute, pour in the juice that you saved early, cover and simmer until the mussels fully cooked (mine took 10 minutes). Salt and pepper to taste. These looks awesome, I love mussels but not the rest of my family :(. Yummmm! That is heavenly looking. It reminds me a little of Oysters Rockefeller, with the lovely green "stuffing" on top. I love mussels, but often find it hard to get nice ones. Beautiful pictures!!! A platter of elegantly matched colors,just amazing !!!! That looks so yummmm! I love mussels. your mussels remember me colors and smells of our seas. Bravissima! archana, thank you, the black color does look good on red. Grace, my hubby also makes a good neighbor with yours, he also doesn't care about mussels. 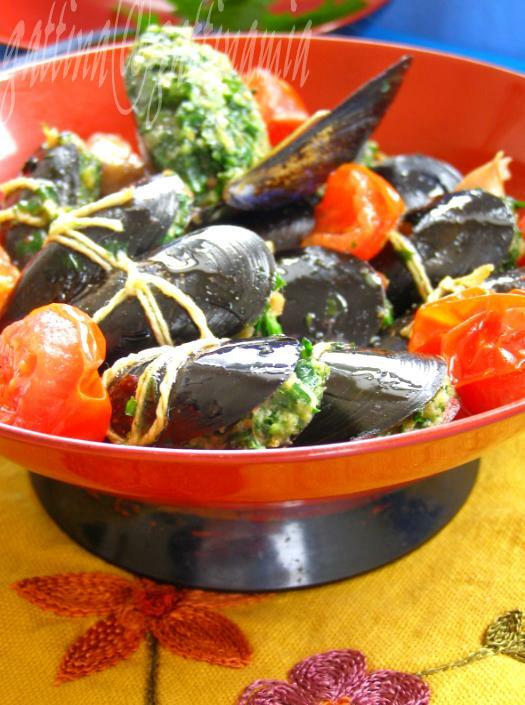 Mussels are so easy to make, but most people don't realize that. These look great! I'm actually having mussels tonight, I like mine on the half shell with butter and a little hot sauce! Yummm! That would be great with a ice cold pilsner. 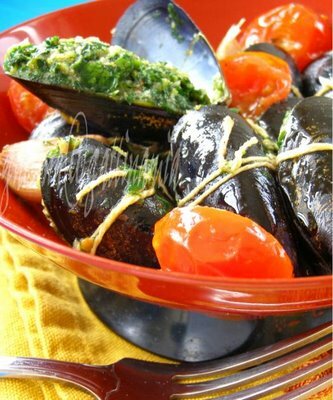 This is interesting.. we stuff mussels with rice and coconut.. just made them the other day and am too lazy to do the detailed write up as yet.I love mussels, so another one for me to try. where do u get ur mussels from? Brilynn, what a lovely dinner plan! I just love mussels regardless how you prepare them, actually I crazy for any shellfish. Burcu, how I couldn't realize that?! I did have a glass of white wine went with them though. 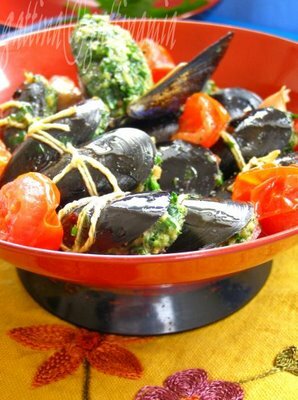 Shaheen, please let me know when you make your mussels in the future, love to see your version! I got these from a fish market (actually which is only a store) in the neighborhood area. I used to buy frozen ones imported from New Zealand (since the Asian store carries them), but they're pretty large which is too much for a mouthful for this dish. oh yummmm! that sounds like a dish which just bursts with flavors! Oh yum! Delicious Gattina! I love mussels! I will keep this recipe to try. MMMHHHH! you're wonderful!! !I have to cook mussels too! very tasty recipe! They look just fantastic. I love mussels, but they're hard to get here, too far from the ocean. I just cut all my swiss chard in the garden yesterday, but I left the stems in the ground just to see if any more will grow before it freezes. Nabeela, you're so right! Thanks! Saffron, thanks for your compliement! Kalyn, it is the thing I can't do... growing my own veg (as I live in a rental house). But I enjoy so much seeing your and others! The mussels looks so delicious. I can't wait to try them. I'm late but I just want to tell you that this looks so pretty and beautiful that I almost would eat them all despite my mussel allergy! Wonderful gattina-you are so talented!